﻿ Best Price on San Jose Corporate Stays Arborea Flats Suites in San Jose + Reviews! Located 5 miles from Multiplaza Escazu and 8 miles from Estadio Nacional de Costa Rica, San Jose Corporate Stays Arborea Flats Suites has accommodations in San José. Free WiFi is provided. Each unit comes with a seating area, a flat-screen TV with cable channels, a well-fitted kitchen, and a private bathroom with free toiletries. A dishwasher and oven are also featured, as well as a coffee machine. Guests can use the fitness center and indoor pool. 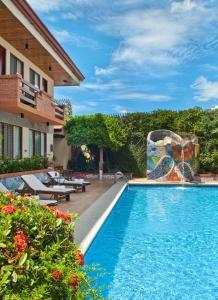 Guests can also relax in the garden, beside the outdoor swimming pool, or on the sun terrace. La Sabana Metropolitan Park is 9 miles from the condo hotel, while Parque Diversiones is 10 miles from the property. The nearest airport is Juan Santamaría International Airport, 10 miles from Corpstay. Please note that all reservations musts be paid in full before arrival.